Would you like to see some of the other handmade gifts I have been busy making this year? I bought some beautiful soaps and wanted to present them in a special way. So I wrapped them in pretty designer paper. 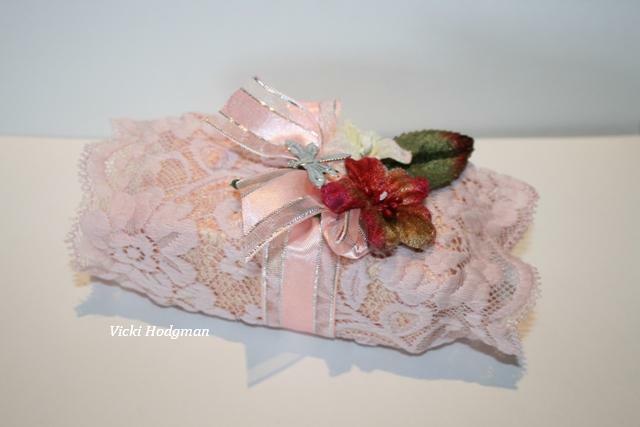 Then hand-sewed the piece of pink lace into a tube. Slipped the wrapped soap inside. Wrapped some ribbon around it and added som velvet flowers, leaves and a metal dragonfly. I also found some cinnamon sticks I had had for ages!! Finally I got round to doing something with them. Come and have a look at these little beauties. The hot glue gun and I were very busy with these. I couldn't help adding some dazzling diamonds to the berries. Some shimmer paint spray also helped in the quest for more glitter. I had a strand of plastic gold musical instruments that came in handy too. I added one to each cinnamon stick decoration. I really can't decide which one I like the best! I will be back in the New Year with some more projects and inspiration. 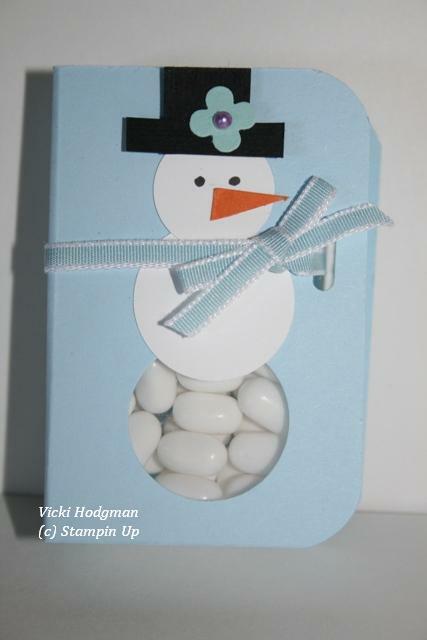 How do you like my little snowman gift? I think it is pretty "cool". hehe. Would you like to make one too? Here is a rough diagram for you. Round the four corners with the corner rounder punch. You will also need a 1 inch circle punch. and a 3/4 inch circle punch. Retired slot punch or other punch suitable for threading ribbon through. A length of ribbon 30cm. Small piece of black card 0.5cm wide and 2.5cm long for brim of hat. Small piece of black card 1.5 cm x 1.5cm for hat. 1 small triangle cut from a piece of tangerine/pumpkin pie card for nose. small itty bitty flower in any colour. Punch out a 1 inch hole in centre bottom of front of card. Round corners. Punch out a hole with retired slot punch (cropadile would also make a good hole). Attach tic tacs with a bit of snail to inside. Stick on a 1 inch circle for body and a 3/4 inch white circle for head. Attach brim over hat and raise up on top of head with a dimensional. Add flower and pearl. 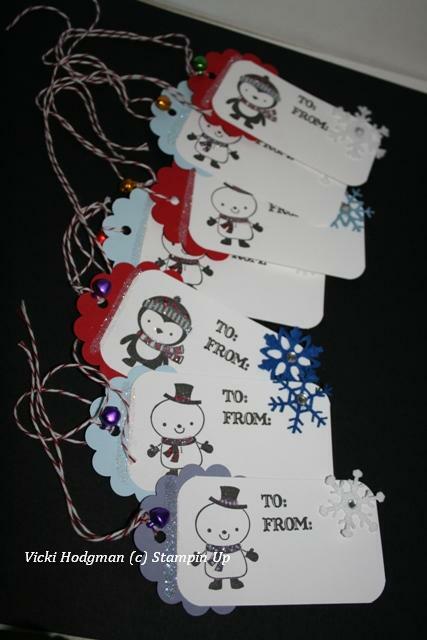 How about some gift tags for Christmas? 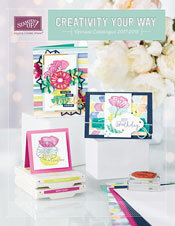 These were just quick and simple to make using the No Peeking Stamp Set (p.23). I really do think this is the perfect set to make up your gift tags with. It has a variety of image and word stamps all suitable for a gift tag. I cut a piece of white cardstock9cm x 5cm and rounded the edges with the corner rounder punch. I added a coloured circle scallop (6cm) to the back and punched a hole in the end for the baker's twine and small jingle bell. Stamp your image and "To and From" in black staz on. A little bit of colouring with a stampin write marker in colour of your choice. A little bit of dazzle with some dazzling diamonds on the edge and on the image. I think they turned out great and will definitely look good on my gifts this year. 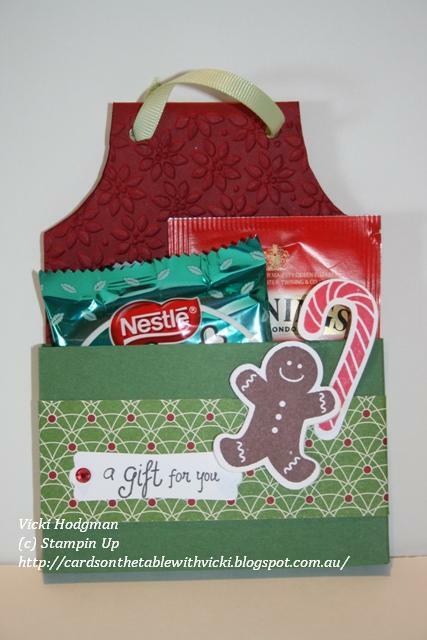 Why not have a go at making some quick gift cards for yourself? You don't really need a lot of supplies to make something that will be admired by everyone. Come and see these Christmas Aprons I have been making for gifts this year. The apron has two parts to it. The card part and the small box/pouch in the front of card which is attached with sticky strip. The green wild wasabi is used for the thin box and cherry cobbler embossed with petals a plenty is the card. It is just wide enough to hold a few little gifts. I have used a strip of designer paper and some images from the Scentsational Season Set. 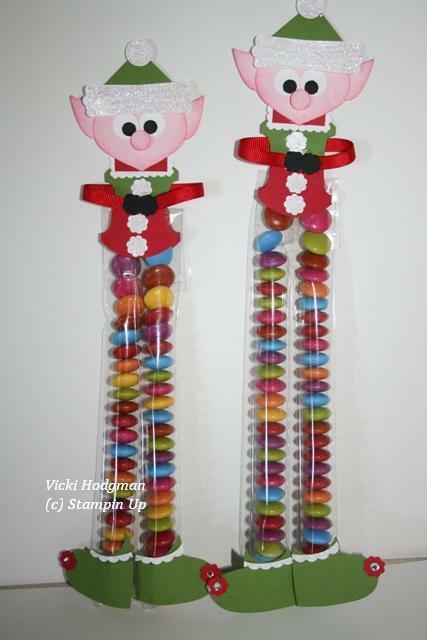 A few of these have found their way into a number of homes this year as Happy Christmas/Thank You gifts. Last Friday I showed you wrapped gift like the one above. As promised, here is what was inside. These can be pincushions for your desk or display for charms. What do you think? 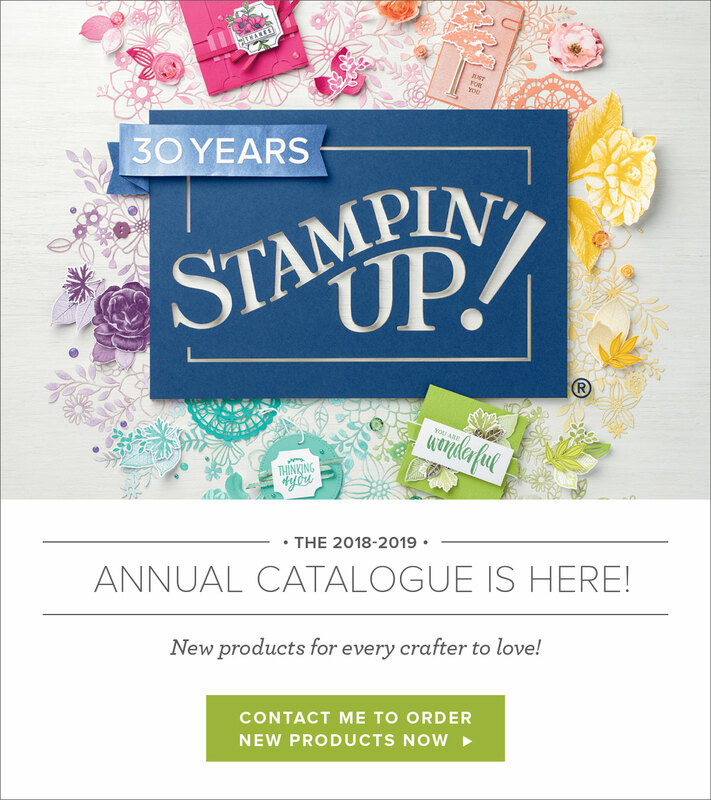 I made a few as gifts this year using the Stampin Up Flirtatious Fabric on page 171 of the main catalogue. The frames are only small from the Cheap Shop. I just cut a rectangle out of cardboard the size of the frame.A bit of wadding placed on top and cover it with the fabric. I stuck the fabric down with some strips of the Sticky Strip Tape. Then put the back piece in. All done and no sewing machine in sight. Aaahhh. just love that. Maybe you could try one yourself? If you liked this project please leave a comment I love hearing from you. Do you like my cute gingerbread man in a jar? 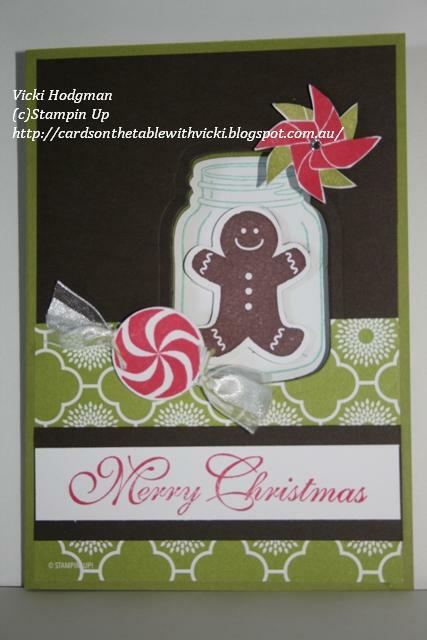 The jar stamp and matching framelit is from the Perfectly Preserved Bundle set p. 29 of the Christmas Mini. The Gingerbread man is from the Scentsational Season Set and the pretty designer paper is from the International Bazaar pack in the main catalogue. I have used Sweets for the Sweet stamp set in the main catalogue p. 49 to make the peppermint and the pretty green and red flower is the windmill from this set too. To make the "wrapper" for the peppermint I used a small piece of organza ribbon stuck behind the candy and then tied each end with a piece of bakers twine. The windmill is just stamped twice and cut out and layered together. Hmmm.. now what else can I put in this jar? Hope you enjoyed this post. Please leave a comment I love hearing from you. As promised here is a quick tutorial on how I made these Elves. I will work in sections for you. And here is what the back looks like. Next we will do the body. 1 piece of ribbon approx. 11cm or 4.5 inches long. Do you like these lovely little vintage brad gift cards? 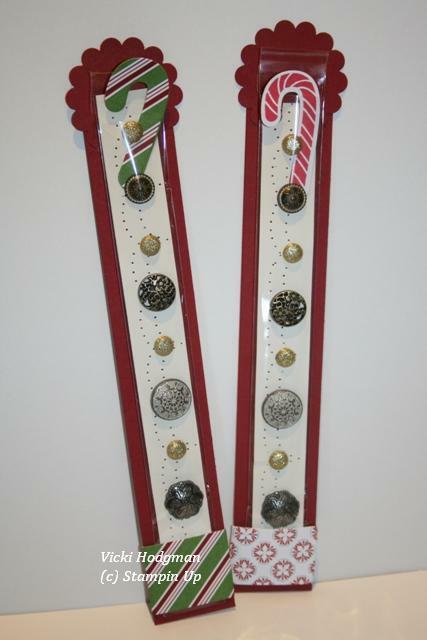 They were one of the gifts to my Downlines this year. I also gave them a cute little elf. Aren't they sweet. Do you see a theme here? I have used the skinny cello bags on page 161 of the main catalogue for both of these projects. Just love em. 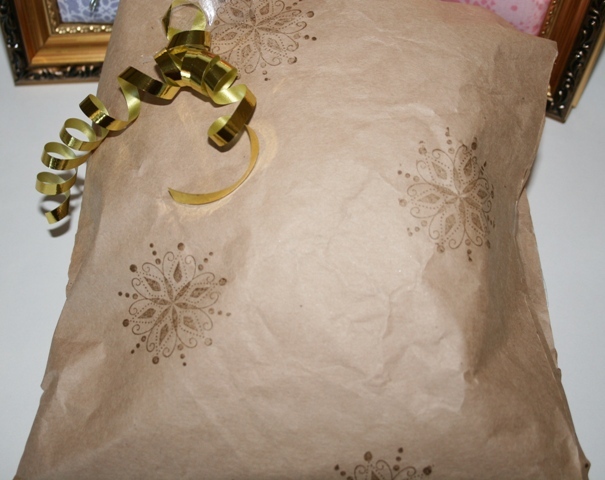 Hmmm... what could be in the recycled brown paper wrapping???? Tune in next Friday for all to be revealed. In the meantime - Did you like those little elves? Would you like a tutorial on how I did them? I will do one this weekend and post it on Monday just cause you are all so good.hehe.